Heading out of town? Why should you be the only one to have all the fun? Book your dog for a stay at Dogtopia of Chester Springs. 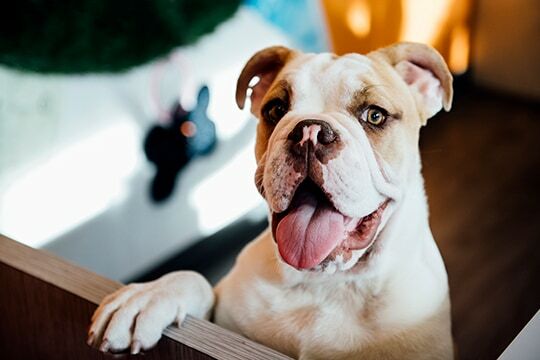 You will feel comfortable leaving your four-legged family member in the hands of our highly trained team of dog lovers, whether it’s just for an overnight stay or for an extended period of time. We strive to make your dog’s stay with us as much of a vacation for them as possible. Our boarding dogs enjoy a full day of group playtime and exercise with our daycare dogs, plus extra TLC at the beginning and end of each day. Our team starts waking the dogs and preparing breakfasts by 5:30 am. After the daycare dogs head home for the day, we feed our overnight guests before showering them with a final bit of individual affection and play. Then it’s off to sleep around 9 pm. Your dog can spend the night in one of our playrooms with the other boarders or you can choose to have your dog sleep in one of our private suite areas. We encourage you to bring bedding for your dog’s visit. You can pack their meals or take advantage of our Natural Planet grain free-food selections at no extra cost to you. We are happy to accommodate any special dietary needs and to administer medication to your dog. Treat your pup to a spa service before they head home so they return from their stay smelling and looking as great as they feel! We are the top dog when it comes to looking after our four-legged guests. Our team is highly trained in every aspect of dog care: from behavior to managing our open play area. Dogtopia of Chester Spring’s management team is certified in dog CPR and first aid. We are proud to have received over 200 perfect reviews between Facebook, Google+ and Yelp. Our customer loyalty is unparalleled! We realize that dog parents can suffer from separation anxiety as well. We provide webcams in each of our playrooms and our outdoor area so you can watch your pooch at play during the day. Weekday hours are 8am-12pm and 2pm-6pm. Saturday hours are 10am-12pm and 2pm-5pm. Before you bring your dog to stay with us, we ask that you bring them to our location for a meet and greet with our team. This will give them a chance to determine if your pup is the right fit for our open play environment. If your dog is going to stay with us, please make sure their vaccinations are up to date and they are free of fleas, ticks and any contagious diseases. Please be sure to bring any medication they may require as well! We ask that you bring your dog to us before 3pm if they are going to be spending the night. This will give them a chance to get used to our facility, our team and the other dogs. Our friendly and helpful staff will work closely with you to determine which boarding package is best suited to you, your dog and your budget. Space for overnight and weekend boarding is limited so we strongly recommend booking in advance. To learn more about our doggy boarding services, please visit our pricing page, fill out our enrollment form or contact us.